Omai Garner, PhD (FEL ’12), and Linda Baum, MD (RES ’89), are dedicated teachers and researchers. Outside of the laboratory and classroom, they find fulfillment working to build social justice and empower youth from underserved communities. In 2007, Omai Garner, PhD (FEL ’12), came to UCLA to work as a postdoctoral fellow with Linda Baum, MD (RES ’89), PhD, a professor in the Department of Pathology and Laboratory Medicine. He also had another reason for moving to Los Angeles. “I was interested in engaging in community outreach,” he explains. “Early on, I told Linda that I wanted to get involved.” Dr. Baum not only encouraged Dr. Garner, she joined him. 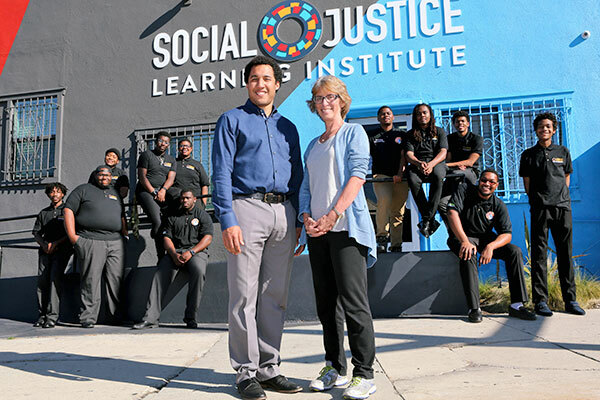 For the past decade, the two have pursued what they call “a wonderful and important mission” — helping to lead and shape the Social Justice Learning Institute (SJLI), an education-oriented nonprofit based in Inglewood, California. Dr. Garner, now an assistant clinical professor of pathology and laboratory medicine, co-founded SJLI, and he chairs its board of directors. Dr. Baum is a member of the board. “Our primary goal is taking care of patients,” she says. “But we also need to be part of the community.” Drs. 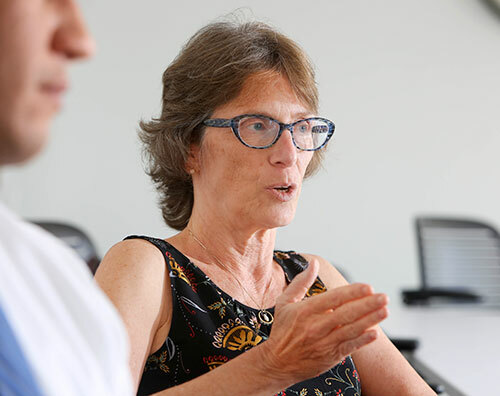 Garner and Baum talked with U Magazine contributor Karen Stevens about the joys and challenges of nonprofit work and the benefits of engagement. Why and how did you get involved with SJLI? Dr. Omai Garner: I am from the Milwaukee area, and Milwaukee is a hyper-segregated city where the black population is the poorest. Growing up, I was a part of programs like SJLI that educated me about racial disparities and helped me be active in the community. I came to UCLA after receiving my PhD from UC San Diego. In the Graduate Quarterly, I read that D’Artagnan Scorza, as part of his graduate research in education, had started a Black Male Youth Academy at Morningside High in Inglewood. He wanted to help students achieve academically and develop a positive identity and leadership skills. I began teaching with him. After about six months, he asked if I knew anything about forming a nonprofit. I did not, but I was feeling overly ambitious, so I said, “Yes.” We started SJLI in 2008. I asked Linda if she would like to be on the board. Dr. Linda Baum: My dad dropped out of high school and my mom did not go to college, so I was interested in how people get exposed to education. My family originally was from New York. My great-grandparents got off the boat at Ellis Island. There was a belief in our family that you were going to make something of yourself. If there were an opportunity, you would take it and pull yourself up. What are the main goals of your organization? Dr. Garner: Education is the through-line for everything. We empower youth from South Los Angeles and neighboring areas to be successful in high school and after graduating. Dr. Baum: We want to help as many students as possible to take their education as far as they can, offering options for kids who come from places where a lot of resources don’t exist. The original and primary focus has been on the group most at risk, which has been boys and young men of color. Now that the approach has proven to be successful, we want to expand it to different groups and to all young people. Dr. Garner: One great example of what we do is our Urban Scholars Program. Its in-school curriculum gives students tools and resources — tools such as a high school diploma and the research methods to identify, understand and find solutions for community problems — to enact change in their communities. More than 1,600 students have gone through Urban Scholars or other programs such as college tours or workshops. Among the Urban Scholars, we have seen an average high school graduation rate of 91 percent and an average college enrollment rate of 87 percent. We also offer Urban Health Fellowships. Each summer, 12-to-20 high school juniors and seniors receive a six-week intensive program during which they learn about chronic diseases. Lecturers come from the David Geffen School of Medicine at UCLA and the Charles R. Drew University of Medicine and Science. We also bring students to campus. They get to learn about all kinds of careers in health care, not just about being doctors and nurses. Dr. Baum: Omai and I both work in the clinical laboratories, where there is a large staff of laboratory technologists who can be involved as career mentors. In addition, there are respiratory therapists and radiological technicians who have worked with our students. One great outcome is that staff, who might not otherwise have a door into the process of community engagement, appreciate being included as role models. The folks we work with in the clinical labs are wonderful and dedicated, but often they are invisible. This gives them exposure, and it has uplifted the esprit de corps. People used to be pretty siloed. They did their jobs. Now they are involved, not only in this, but also in other programs involving men’s health and a health fair for the homeless. Being part of the community snowballs. Have colleagues in other areas also been inspired by your work? Dr. Garner: I have had physicians ask how I turned the outreach I wanted to do into something as successful as SJLI. Some want to participate with us, and some people have their own passions and want to do things themselves, now that they see what we are able to do and how a successful nonprofit works. Dr. Baum: Another thing that is great is that we both teach in the medical school. UCLA is in the city, but it is an expensive part of the city. Our students come from all over. It’s good for them to know from the first day that faculty are engaged. It is important for them to know we don’t exist just in the ivory tower of academia. SJLI’s impact on the community extends beyond education. Dr. Baum: What we realized over the years is that education ties into community engagement. It is very hard for students in a community that is underserved to be successful in school. We focus on education, but we also try to make life better, more enjoyable, for the students who participate in our program. For instance, students can take on research projects that respond to problems such as food justice or environmental justice. Dr. Garner: We have classes that have trained thousands of community members in nutrition, gardening and physical fitness. We are a partner in programs such as BLOOM (California Community Foundation’s Building a Lifetime of Options and Opportunities for Men), which helps redirect the lives of young black men involved in the probation system. How else has the nonprofit evolved? Dr. Garner: We started with D’Artagnan and volunteers. Now, we have a paid staff of 21 and a nearly $2 million annual operating budget that comes from philanthropy, grants and contracts. We have touched thousands of lives, including students who have gone on to college and ones who succeed in other ways. Besides college, there are equal measures of success such as value to the community. You can go on to firefighter school or be an EMT. Dr. Baum: The graduation rate among our students has skyrocketed. Just to finish high school is important. For many of these kids, it wasn’t expected. It is sad how kids who are really able and capable can be brought down by bad expectations. How have your own roles evolved? What have you learned? Dr. Garner: I learned there are two pieces to a nonprofit. One is doing the on-site work. The other, which is less well-known, is what the board of directors does. When D’Artagnan and I pieced things out, it was clear that he was going to be the executive director and lead the active side and that I was going to tackle the board. For the board, you need committed people who are interested in the financial well-being of the nonprofit. You also need to identify a small group interested in the strategic planning. What Linda and I do, what we spend our time thinking about, is how to grow and support the organization. Dr. Baum: For board members, it’s important to realize that our primary responsibility isn’t to be the teachers and coordinators but to help in other ways. For example, we can come at things from a different angle. As hard as it is for the people doing the boots-on-the-ground stuff, you need someone who is able to take a look and say, “This program is going great, but this one is not yielding results. Do we need to keep putting resources into it?” Omai and I are scientists, experimentalists. We are flexible, not “We have to do it this way.” We also are quantitative geeks. D’Artagnan is more qualitative, which is good because it’s important to have lots of tools in your toolbox. He looks at how students’ lives are impacted. Having these stories is fantastic, but you also need quantitative data so you can measure success accurately and honestly. We can help maximize output and benefits. One of the things that has made SJLI successful is D’Artagnan’s willingness to approach things intellectually. Design an intervention and come up with measurable criteria to see if it works. Define a population, show you’ve made significant change in the population, adjust for variables and expand. You mentioned that finances are one of the board’s major concerns. Dr. Garner: When we first started, we were the grant writers. Dr. Baum: We work in a system where we know how to get grants, to get funding. From the get-go, we said to D’Artagnan that we have to have a diverse portfolio of resources. Find some high-value donors, but we also need grants because the external validation is important. One challenge is that small organizations sometimes can’t see the bigger picture. That is where our experience at UCLA helps. Omai runs a section of the clinical labs. I was director of the labs for several years. We teach, but we teach at a different level than high school. UCLA operates at a different scale. Because of this, we see things in a different way. We can help figure out how to scale things up. Has your work with SJLI enhanced your work at UCLA? Dr. Garner: Yes. I have found that community engagement is an essential part of being a professor. It also has had an impact in other ways. For example, one National Science Foundation grant awarded to UCLA to develop the next wave of diagnostics for chronic heart disease and diabetes includes funding to reach out to underserved communities, such as the kinds of communities with which SJLI works. What would you like to see your organization achieve in its second decade? Dr. Garner: The first 10 years were about “Can we build something?” We did. We have a program that has an effect on the most at-risk population, boys and young men of color. Now it serves as a model for what we can use across the United States. The next 10 years is about improving on the programs and expanding nationally to other urban areas. Outside of Southern California, we have done programs in Sacramento and Houston. By scaling up, we think we can connect with hundreds of thousands of students across the country.